The Nokia Lumia 800 has an 8MP camera with a lot to brag about - it has a 28mm wide-angle F2.2 lens by Carl Zeiss and as we already mentioned in the hardware section of this review the sensor behind the lens is quite clever too. It produces 8MP photos with 4:3 aspect ratio or 7.1MP photos if you want 16:9 aspect ratio for your shots. The Lumia 800 may have the same camera module as the N9, but the new chipset has different image processing. The amount of detail is good, but there's noticeable color noise left in the photos. The noise processing in the N9 did better by eliminating the color noise and not losing as much fine detail. Sill, the Lumia 800 has accurate white balance and good color rendering. The dynamic range is as impressive as it was on the N9. We also snapped a macro shot, here it is. The Nokia Lumia 800 steps up in our photo quality compare tool to face other 8MP shooters. The tool's page will give you more information on what to look out for. While we were lining up the shot for the first chart, we noticed a huge pink spot. That was gone as soon as we snapped the photo. The color patches in the second chart look accurate, but you can spot color noise, especially in the blue patches. The third chart is shot under artificial lighting and the automatic color balanced produced a blue shot, so when shooting indoors, you might want to set the white balance to incandescent/fluorescent for more accurate results. 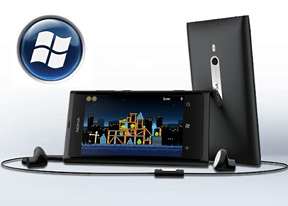 Windows Phone has yet to break the 1080p barrier and the Lumia 800 isn't the phone to do it. It's limited to 720p, which is now within the reach of cheaper smartphones. Still, it's quality, not quantity that we're looking for. Continuous autofocus is available while recording. The Lumia 800 was way too eager to hunt for focus - if there's constant action in the scene, the Lumia 800 would refocus every several seconds, which gets really annoying. There's no way to lock the focus and the camera would always focus at the beginning of the video (even if you make it focus before you start recording). Much like the N9 (and a lot of other phones too), the Nokia Lumia 800 shoots videos with varying framerate. We've seen anything from 25fps (usually in dark scenes) to 30fps (in well-lit scenes). And depending which framerate it goes for, you would get either a smooth or a slightly choppy video. The Nokia Lumia 800 might be good enough for shooting not too fast-paced scenes, but for that price tag we really expected better. The video quality is surprisingly good - there's a lot of detail for a 720p shooter, the image looks crisp and free of noise and artifacts. Videos are shot with 15Mbps bitrate, which is more than some 1080p shooters and double of what the N9 does. Videos have stereo sound but at a low bitrate (it hovers around 50Kbps). If Nokia would fix the autofocus issue and bump up the audio bitrate (the N9 des 132Kbps), we'd be very happy with the video recording. Here's an example of what the Nokia Lumia 800 is capable of. We've prepared an untouched 720p@30fps video sample (0:10s, 17.9MB) from the Lumia 800's camera for direct download. It's time for the Nokia Lumia 800 to go into our video quality comparison database. As far as synthetic resolution goes, it did really good. The positive impressions remained even in our other setup that's closer to real-life usage. In the dark, the image gets noisy but still preserves good amounts of detail.